How can I upgrade my SocialPilot account? We are happy to know that you are enjoying using SocialPilot! When using SocialPilot, you'll be required to pay in US dollars. We accept payments made with credit cards and PayPal. Please log into your SocialPilot Account. Go to Settings -> Membership page. Select the plan you would like to upgrade. 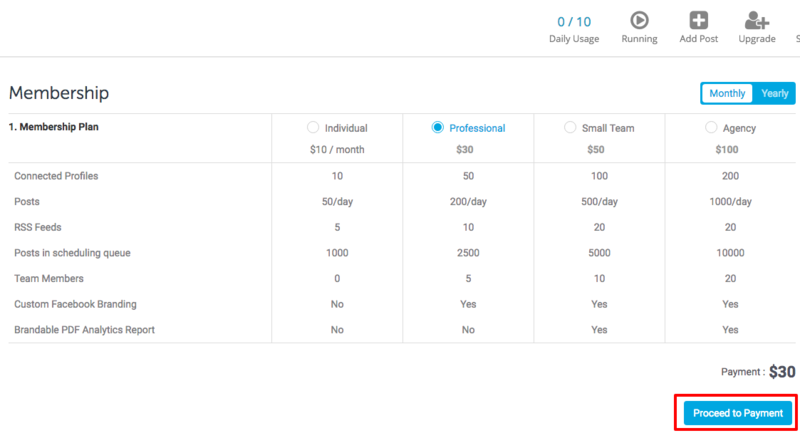 Then, select the monthly or yearly billing cycle. Click on "Proceed to Payment" button. Make payment with your Credit Card or Paypal account. Once the transaction is successful, your membership will be upgraded. You can review and download the membership invoice from our Billing page. If you wish to have a look at the plans we offer, please visit this page. Say, you've been using the Professional plan for a week. Now, you realise that the Small Team plan suits your needs better. Just upgrade your SocialPilot account with the above-given steps. You won't be charged twice when you upgrade your account. While upgrading, you'll be asked to pay just the difference.